Loh Cai Hao, 23, was part of the first Singaporean duo to finish 16th in the World Curling Tour last year. The first time Justin Sim, 21, went snowboarding in Korea in 2011, he crashed through a gate and tore right through a banner. But instead of deterring him from pursuing the sport, this experience did just the opposite. “It was exhilarating and unlike any other sport I’d done before,” said the first-year Nanyang Business School (NBS) student, who escaped from the incident unscathed. Snowboarding was new territory for him. Not only did it require snow-laden mountains, but it was also more challenging than other sports he had played in Singapore. He began going on annual trips to countries like Japan, Korea and Australia with friends to practice, and is now an experienced snowboarder who tackles the most difficult slopes and paths in search of an adrenaline rush. Sim took a two-year hiatus from the sport when he was serving his National Service, but jumped back into it when he travelled to Val Thorens in the French Alps last month. But being an avid snowboarder is tough in tropical Singapore, said Sim. The only opportunity he has to enjoy the sport is over the holidays when he gets to travel, and travelling so often is expensive. He typically spends at least $1,000 on gear, entry and accommodation during each trip. To continue pursuing the sport here, he occasionally goes wakeboarding, which he said is similar to snowboarding. “But there’s really no substitute for snowboarding,” said Sim, who hopes to try more ungroomed snowboarding paths in the future. Not many Singaporeans know about curling, a sport in which players slide heavy, granite stones along sheets of pebbled ice to reach a circular target. But when Loh Cai Hao, 23, saw it being played on television at the 2014 Winter Olympics, his interest was piqued. He found the sport “peculiar” and was curious to find out more about it. After watching some curling videos on YouTube, he tried it out for himself at the Equatorial Curling Club, Singapore’s only curling club, at JCube. He was hooked. 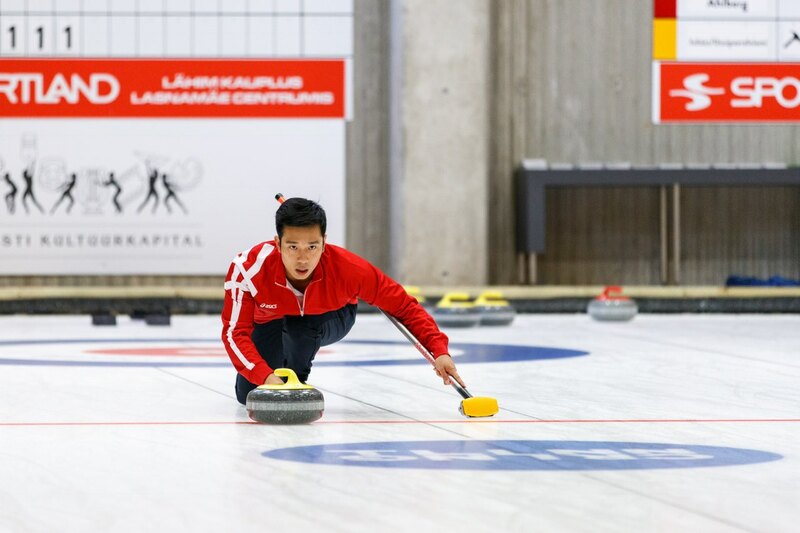 Singapore does not have an official curling team as the sport has not yet been recognised by the National Sports Association, but Loh signs himself up for competitions and competes internationally for the club. His latest competition was in Estonia last September, where he spent three days at the Tallinn Mixed Doubles International Tournament competing with a fellow Singaporean curler who lives in America. The pair was the first Singaporean duo to win a match at the World Curling Tour in Tallinn, and finished 16th out of 18 teams. But Loh quickly realised that practicing in the ice hockey rink at JCube was not the most ideal practice ground as the sport is usually played on pebbled ice. “The rock reacts differently on the ice-hockey ice, and I don’t have the chance to curl as much as I would like to,” he said. As a result, Loh chose to spend his six-month exchange programme in Switzerland last semester so he could have more opportunities to train at a more advanced level. “In Zurich, I can train at a curling club for two hours a week, but in Singapore, I can’t even train once a week,” said Loh. He hopes that Singaporean curlers can eventually get a dedicated curling facility, which will give them more time to practice. Since the rink at JCube is shared by different users, the curling club only has a limited time to train. The rink is for public use and can only be booked after 9.45pm on weekdays, but it is usually booked by other winter sports like figure skating and ice hockey, that get priority over curling. They get an hour for curling on Saturday mornings, but this is used to teach newcomers, leaving very little time for training. Alicia Chong, 23, feels the strongest when she’s on the ice. She had tried out several sports like badminton, inline skating and cycling, but all of them made the recent School of Humanities graduate feel clumsy. When she tried figure skating, however, she felt different. It came naturally to her, she said. She now has about 11 years of experience under the belt, and trains and coaches other figure skaters at least 12 hours a week at the indoor rink at JCube. Chong chose to go to Canada for her exchange programme two years ago, where she trained under different coaches to learn new techniques. She also went to Hong Kong and Kuala Lumpur last year to train. “Every time you move up a level you feel great,” said Chong, referring to figure skating classifications that are similar to dance grades. There are four core and 10 freestyle levels. Skaters accomplish certain skills to advance further. While Chong has not been officially tested, she has accomplished many of the spins and jumps required for the higher levels. However, figure skating is an expensive sport to pursue in Singapore. Competition-level skates can cost up to $1,000 a pair, and lessons can set learners back by as much as $150 an hour. Because of these costs, Chong’s training has been put on hold several times until she had enough money to start classes again. While she no longer competes, she continues to train weekly and the sport still brings her joy.